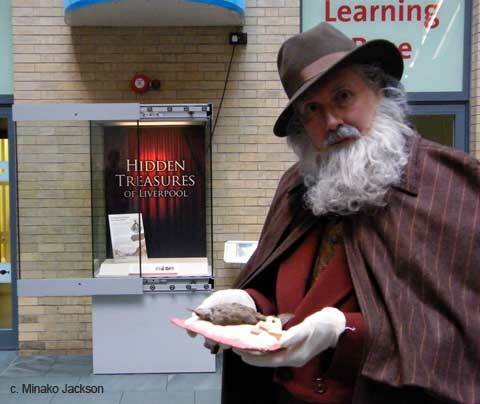 Happy Birthday to Charles Darwin, he’s 200 years old and although his beard is long and grey he seems remarkably fit (this is actually Paul Netterfield in costume). That bird looks amazingly similar to Tracey Emin’s Roman standard that went missing a couple of times last year but it still has Darwin’s original hand-written label tied to it. A bird specimen collected by Charles Darwin on the legendary voyage of the Beagle is displayed at the World Museum Liverpool to mark the 200th birthday of the great naturalist. Darwin collected the ovenbird in 1834 as the Beagle explored Wolsey Sound in the Straights of Magellan at the southern tip of South America. 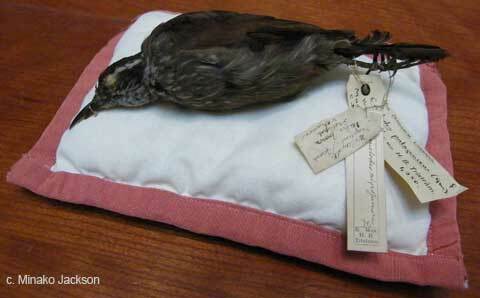 The specimen is a dark-bellied cinclodes (cinclodes patagonica) and has been in the museum’s renowned collections since 1896. Darwin wrote on the label that the stomach was full of shellfish and the bird was very common. They are called ovenbirds because they build nests out of hard mud, resembling round ovens once used by Dutch people. When the Beagle returned to Britain in 1836 after the epic five-year voyage around the world, 27-year-old Darwin became a celebrity. He had collected thousands of specimens of all kinds of creatures as well as fossils. Darwin’s researches led him to his monumental and controversial theory of natural selection which was published as On the Origin of Species in 1859. Darwin was born on 12 February 1809 at Shrewsbury. To mark the birthday on Thursday 12 February 2009, Paul Netterfield premiers his performance as the older Darwin. He will greet visitors to World Museum Liverpool at various times in the day and talk about Darwin’s theories and the voyage of the Beagle. Paul will appear at other events later in the year including a Darwin Trail unveiled in March and a new family show at the Treasure House Theatre in June.